Last year ESRI had a good developer contest for ArcGIS Server. This year it is even better (and easier). 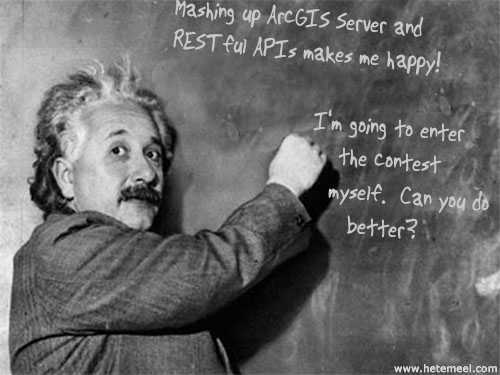 There are two contests; the ArcGIS Server Mashup Challenge and the ArcGIS Mobile Challenge. Why is it better? Well for starters, ArcGIS 9.3 Server is a much better developer environment than 9.2 was (heck, you can create a mashup without knowing a thing about coding) and now there is also a ArcGIS Mobile contest as well (for those who roll that way). You must be a licensed user of ArcGIS Server 9.2 or 9.3 and all entries must be submitted by March 6, 2009.